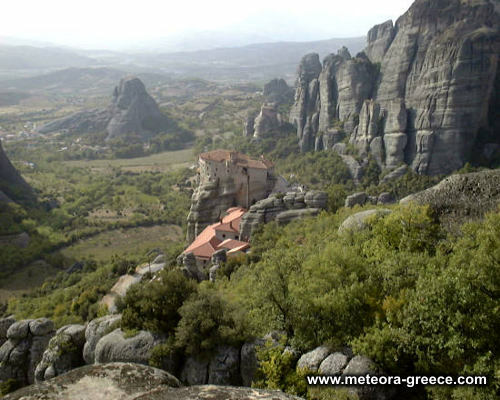 The Holy Monastery of Rousanou is dedicated to ‘The Transfiguration’ but honoured to Saint Barbara. It took its present form in the early 16th century, by the monks and brothers Ioasaf and Maxim from Ioannina. The catholic is devoted to the Transfiguration of Jesus. Also, the memory of Saint Barbara is honoured (4th December). The frescos are remarkable and are created by an unknown hagiographer influenced by the Cretan school under the monk Arsenios, (perhaps by Georgie, student of Theophanis the Cretan). The ‘Katholikon’, in the Athonite type, was founded in the middle of 16th c. and decorated in 1560. Both, the Katholikon and the reception halls are in the ground floor while the ‘archontariki’, cells and subsidiary rooms are scattered in the basement and the first floor. Visitors are impressed when they see it from a distance. The monastery spreads all over the surface of the peak of the rock and it gives the impression of a single construction. The present construction shape was formed during the third decade of the 16th century.